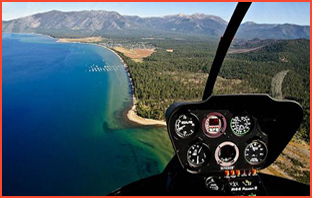 For the daring couple that’s searching for an extraordinary way to exchange their wedding vows and rings, zipping down the aisle of matrimony at elevated heights in a helicopter suspended over Lake Tahoe is one way to do it. Being pronounced as husband and wife at one of the most beautiful places on earth while whizzing through the air would undoubtedly be a gripping experience on your wedding day. 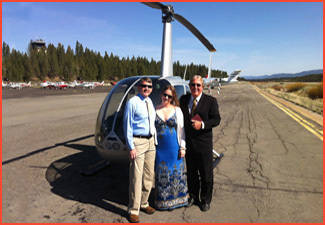 Your Tahoe wedding affair begins at the airport in South Lake Tahoe where you will board an aircraft with seating for the bride and groom and the minister. Flying at an altitude where the unimaginable outlook is to the horizons and beyond, the marvels experienced will be nothing less than spectacular. 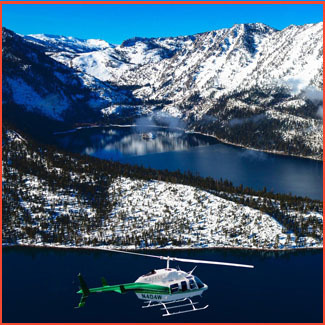 The colossal peaks of the striking Sierra Nevada Mountains that encase Lake Tahoe in addition to the extensive multi-colored shoreline of the largest alpine lake in North America are just a few of the magnificent exhibitions that await you on your matrimonial voyage in the sky. 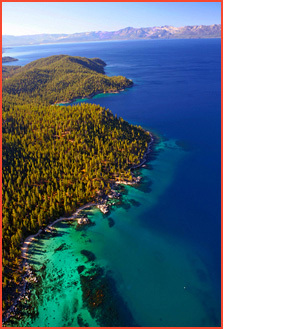 The approximate 20 minute cruise will also entail sights of legendary Emerald Bay Falls, the stony-strewn formations found along the shoreline of picturesque Zephyr Cove Beach, and Lake Tahoe’s rocky landmark that towers above the sparkling aquatic known as Cave Rock. After exchanging vows and rings in midair and at the conclusion of your first kiss as husband and wife, the remainder of your tour can be spent enjoying the amazing panorama as newlyweds. The wonders of the vast and impressive landscape will incontestably contribute to the enjoyment of your very special day. 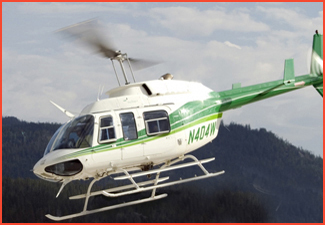 Helicopter package consists of three flight tickets – one for the bride, groom, and minister.